Jenni Murphy graduated from Loughborough University with a degree in illustration. Using soft brushstrokes, tropical colours and distortion of scale, she creates intimate worlds where people are little more than a centimetre high and dominated by magical landscapes and creatures. About the artist: Jenni Murphy is a British artist and illustrator, based in Norwich. When she was 5, she drew a picture of a giant rabbit at school and her teacher told her parents, 'Your child is going to be an artist!' Amazingly, the teacher was right. Jenni's work has an distinctive dreamlike quality. She uses deep vivid colours, but with light brushstrokes for contrast. Often, her tiny characters are dominated by the scenery, or different motif. It’s evocative of childhood and dreams, where things seem bigger than you and your view isn’t fully formed yet. 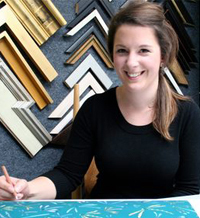 Working predominantly with acrylics, Jenni layers her work to intensify the colours and give the perception of scale. She likes to take a sketchbook on her travels, documenting real people, then filtering them through her imagination to produce pieces of wondrous art. 'I like discovering the wonders of the world with a paintbrush and plentiful cups of tea,' she says.